The horned frogs of the genus Ceratophrys, in some forms, are beautifully adomed and highly aggressive creatures. Some grow to a length of eight inches and have an immense body bulk. All of the horned frogs have enormous mouths and are highly predatory, the food of some consisting almost solely of other frogs. Large specimens will attack anything which threatens them. They can inflict painful bites, holding on with bulldog tenacity. Even the tadpoles of the horned frogs are highly carnivorous. Some species of horned frogs are small, but several grow to huge size and have beauti- fully blended coloring of reds, tans, browns, greens, and blacks. On the jungle floor, among leaves and debris, they can hardly be seen. They move about little, preferring to lie in ambush for the unwary snakes, lizards, mice, and other vertebrates which come within range of their powerful jaws. The "horn" of the horned frogs is a curious triangular prolongation of the edge of the upper eyelid. It is not hard or sharp, as it is only a flap of skin, but perhaps it makes the wide head appear even wider and therefore less acceptable to the forest creatures that would normally dine on these frogs. The Ornate horned frog, Ceratophrys ornata, is also known as Bell's horned frog. It grows to 43/4inches. It is bright green with large reddish-black spots with yellow margins. The head is very large and the mouth very wide. The Columbian horned frog, Ceratophrys calcarata, is a rather quiet and demure species, for a horned frog. The coloration varies from pale beige to darker greenish- brown with yellow. There are darker brown to black spots and irregular bands. The Ornate horned from is from eastern Brazil and eastern Argentina. 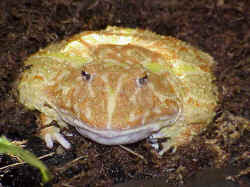 The Columbian horned frog inhabits South America. There is a belief in Argentina that if an Ornate horned frog bites the lip of a grazing horse, the horse will die from the bite. No poison exists in the mouth of this frog, and it has probably earned this bad reputation by its extreme aggressiveness and its willingness to attack an animal many times its own size and bulk. Horned frogs like to burrow in the moss after a good meal. Their extremely wide mouths and steel-trap jaws are certainly useful in subduing prey larger than the beetles and other small invertebrates that are customary food of the majority of other kinds of frogs. They rarely move about, preferring to lie in wait for prey. When threatened they are surprisingly fearless and aggressive, even jumping toward the enemy and biting. Their vocalization sounds similar to bovine bellowing. Ornate horned frogs will swallow prey up to their own body size, feeding on frogs, lizards, mice, and large insects. These frogs spawn in standing waters such as jungle pools and small river lagoons.